From Kenneth Johnson’s first book “Jaguar Wisdom” I learned that 8-Ba’atz was an important day in the Tzolkin round; considered even to be the round’s “new-year’s day”. Traditionally, it is the day on which new calendar shamans (daykeepers) are to this day initiated, in unique and due ceremony. Looking at this through my Western eyes (back in 2009), it was immediately odd to have a new cycle begin on the 8th rather than the 1st day. What’s the point of beginning to count from 8? Ever since then, this question made me examine my concept of time from new angles, and gradually reach a point from which I can look at the Tzolkin (and at Time in general) in completely different ways. If we take the solar Ha’ab count of days as another example, we’ll find that the ‘seating’ or 1st day of each month occurs on the 20th and last day of any given month. So their months begin with ‘seating’ (zero), then 1, 2, 3… 19, and back to seating again, of the following month. 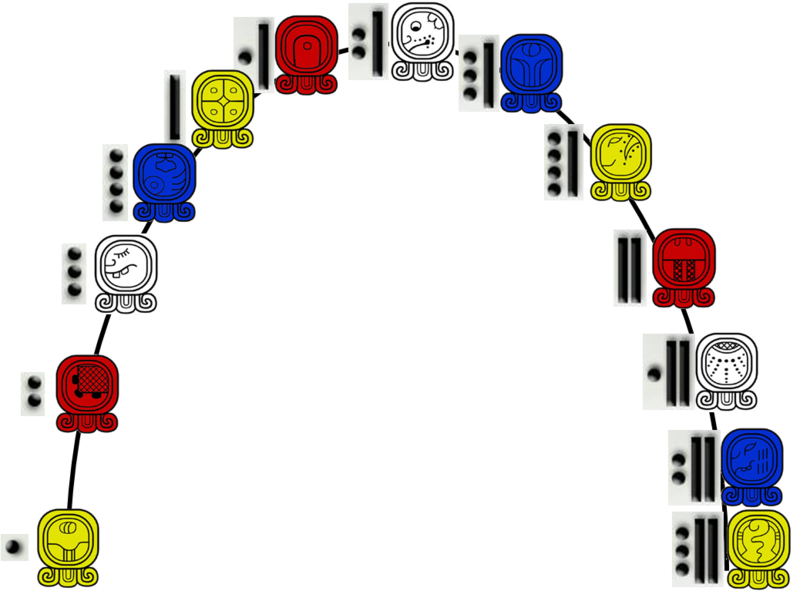 8-Ba’atz is the round’s initiatory point because, according to this Mayan system of knowledge, it is best to initiate and have ceremony at a point of balance in the 13-day trecena count, rather than at its beginning (1) or end (13). Again, according to Johnson, most all Tzolkin-based Mayan ceremonies take place in days 6-9 of any given trecena – the most balanced days. The entire Tzolkin round’s balancing point is not found at the absolute midpoint (which is 7, with 6 numbers evenly distributed before and after it), but rather off-center (8), rounded upwards and leaning forward in time, towards the upcoming, on-deck process/trecena. By another Western count, Imox is considered to be the 1st sun-sign. Here again we find that the sun-sign selected to mark the round’s point of origin is Ba’atz – the 11th sun-sign counting from Imox. So it’s another point of balance that’s rounded up slightly upwards (the absolute midpoint being both Ok and Ba’atz). The 1-Kat trecena takes place in the 8th uinal (or 20-day count, out of 13) – Another resonance. According to Apabyan Tew, a Mayan pregnancy shaman, the number eight is known as the point of return, since it’s where you’ll find the sun-sign that ruled the previous trecena. Today’s 8-Ba’atz, and the previous trecena was 1-Ba’atz. I realized that my fixation with determining first and last is deeply rooted and shared with most of my fellow history-oriented, Judaeo-Christian-Islamic folk. 1-Kat is the best time to celebrate social networking and current social tools, the eternal Facebook included. It’s a time to celebrate each and every way of connecting with another person, regardless of the tools I use. Naturally, not using any tool and just meeting face to face still seems the best choice. But even if we can’t physically meet, in our current age of connectivity abundance, there are many means of connecting and sharing. The day of manifestation in this process is 10-Aj (25 August 2018). This is the day on which a clear line is drawn between what’s real and what’s just an opinion; between theory and reality. Known in the east Indian Vedic tradition as the Web of Indra, the union (or ‘entanglement’) that abides between you and me (Kat) is not something that needs to be achieved or put together slowly over time. It has to be acknowledged as a constant and indestructible reality. No level of technology can finally alienate nor divide us. And technology, however flawed, distracting, or dangerous, is here to stay. Might as well celebrate it. Timothy Leary (11-Noj) said to UCLA students in 1968 (I’m paraphrasing) LSD is what evolution has introduced into our mouths at this time to counter the destructive ‘whiskey-drinking, crew-cut, grown-up’ mindset. So in the same way, the 2012 world-wide Mayan calendar craze gave attention to the Tzolkin, which is still being observed by many people outside Guatemala for over 10 years now. Can’t it be one of Leary’s evolutionary tools, introduced at the right time to creatively rise above otherwise impossible limitations? The ironies of the universal artistic mind (1-Ba’atz) led me out of the cave of the ego and back to real people and real challenges. These are the challenges that I face when I move from the abstract musings of the artist to the crafty handiwork of the artisan. Manifestation’s promise of abundance begins to unfold today, 1-Kat, and continues for the next 12 days. When I take the time to think about it, the Tzolkin can teach me something new every day. This applies to both profound and trivial insights. For example, while editing this post last year, I noticed something new: Star War’s dark side emperor is played by actor Ian McDiarmid (born 8-Ba’atz). His arch-rival, Luke Skywalker, is played by actor Mark Hamill (born the following day: 9-E’). It makes watching the scenes with both of them all the more interesting.